A delicious, easy to make candy that's perfect for holiday gift baskets. 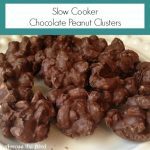 Place peanuts in slow cooker and spread evenly. Break the German Sweet Chocolate into small squares and place on top of nuts. Add almond bark. No need to break it into pieces. Turn the slow cooker to low. Cover and cook for 3 hours. While it's cooking, place mini cupcake liners on counter top. Remove crock pot lid and stir until the mixture is well blended. Spoon the candy immediately into cupcake liners. Once the candy has cooled, remove from liners and place in a sealed container.